Sprint Nextel (NYS: S) reported earnings on April 25. Here are the numbers you need to know. For the quarter ended March 31 (Q1), Sprint Nextel met expectations on revenues and exceeded expectations on earnings per share. Compared to the prior-year quarter, revenue increased and GAAP loss per share expanded. 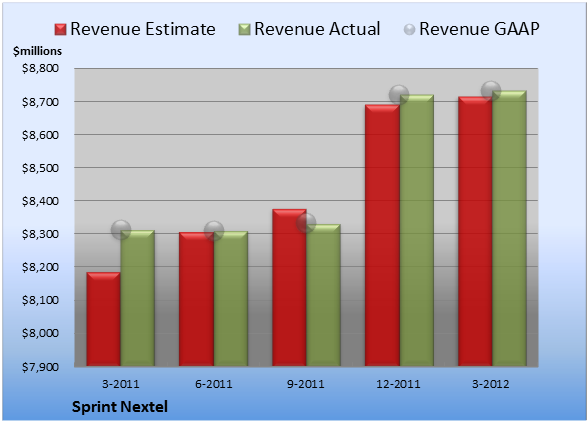 Sprint Nextel notched revenue of $8.73 billion. The 23 analysts polled by S&P Capital IQ predicted a top line of $8.72 billion on the same basis. GAAP reported sales were 5.1% higher than the prior-year quarter's $8.31 billion. Non-GAAP EPS came in at -$0.35. The 15 earnings estimates compiled by S&P Capital IQ predicted -$0.39 per share on the same basis. 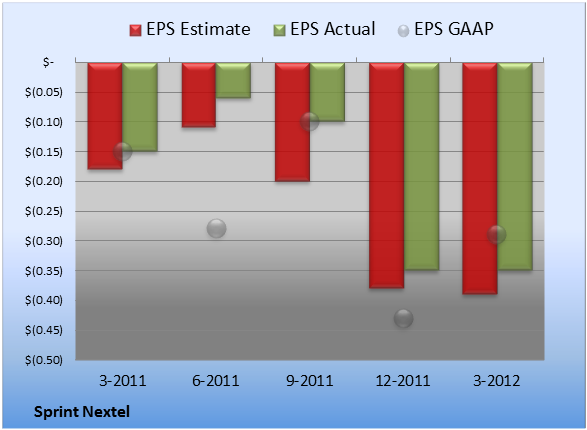 GAAP EPS were -$0.29 for Q1 compared to -$0.15 per share for the prior-year quarter. For the quarter, gross margin was 41.8%, 530 basis points worse than the prior-year quarter. Operating margin was -2.9%, 600 basis points worse than the prior-year quarter. Net margin was -9.9%, 460 basis points worse than the prior-year quarter. Next quarter's average estimate for revenue is $8.72 billion. On the bottom line, the average EPS estimate is -$0.37. Next year's average estimate for revenue is $35.18 billion. The average EPS estimate is -$1.33. The stock has a two-star rating (out of five) at Motley Fool CAPS, with 1,972 members out of 2,430 rating the stock outperform, and 458 members rating it underperform. Among 408 CAPS All-Star picks (recommendations by the highest-ranked CAPS members), 297 give Sprint Nextel a green thumbs-up, and 111 give it a red thumbs-down. Of Wall Street recommendations tracked by S&P Capital IQ, the average opinion on Sprint Nextel is hold, with an average price target of $3.67. New mobile devices and services are changing the game and potential profitability in the wireless industry. Some will fail, some will tread water, and those providing the right services and the right devices will shine. Where does Sprint Nextel fit in? Who will lead going forward? Check out "3 Hidden Winners of the iPhone, iPad, and Android Revolution." Click here for instant access to this free report. Add Sprint Nextel to My Watchlist.